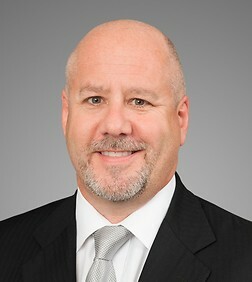 Brad Graveline is a partner in the Intellectual Property and Litigation Practice Groups in the firm's Chicago office. Brad has more than 25 years of experience litigating patent infringement cases, trademark disputes, cases involving theft of trade secrets, and other commercial matters. His patent infringement experience involves a variety of technologies, including pharmaceuticals, biologics, medical devices, nutrition supplements, security screening systems, software, and wireless communications. Brad led the trial team that secured a key patent victory for SecurityPoint, the company that invented the system of recycling trays through security screening checkpoints by use of movable carts that TSA uses in commercial airports throughout the United States. After an 8-day trial, the United States Court of Federal Claims concluded that SecurityPoint’s patent is valid and infringed by TSA. The court held that the government failed to prove that any of the asserted claims would have been obvious, the testimony of the government’s key expert “smack[ed] of hindsight”, and “the balance of the evidence regarding the objective indicia of non-obviousness weigh[ed] strongly in favor of” SecurityPoint. Brad has substantial expertise in Hatch-Waxman litigation and has represented pharmaceutical companies in over twenty-five ANDA cases. He frequently represents highly visible clients in high-stakes ANDA cases and has served as lead trial and appeal counsel in numerous cases. In addition to intellectual property litigation experience, Brad has worked on a wide array of other commercial cases in the areas of professional responsibility, breach of contract, product liability, securities, antitrust, and class action defense. Brad also manages a trademark prosecution team that handles the global protection and enforcement of trademark portfolios, and he counsels clients in the strategy and procurement of trademark rights. He is a qualified mediator in the Northern District of Illinois Lanham Act Mediation Program. Brad has represented Alembic Pharmaceuticals; Abon Pharmaceuticals; Incepta Pharmaceuticals; Barr Laboratories; Teva Pharmaceuticals; Symbiotec Pharmalab; Sun Pharmaceuticals; Macleods Pharmaceuticals; SillaJen; Essentra; Chemo Group; Everett Laboratories; Stryker; Abbott Laboratories; Moffat & Co.; HD Buttercup; SecurityPoint Holdings, Inc.; HTC; MacLean Power Systems; Morningstar; Nuveen; and General Electric Co. Representation of Alembic Pharmaceuticals in ANDA litigation relating to febuxostat. Teijin, et al. v. Alembic, et al. Representation of Abon and Incepta in ANDA litigation relating to extended release gabapentin. Depomed, Inc. v. Incepta Pharmaceuticals, et al. Representation of Everett Laboratories in multiple cases involving nutritional supplements. Everett Laboratories, Inc. v. Acella Pharmaceuticals, LLC. Representation of Teva in patent infringement litigation relating to the oral contraceptive product YAZ®. Teva Pharmaceuticals USA, Inc., et al. v. Bayer Schering Pharma AG, et al. Representation of Barr in ANDA case involving patents relating to dutasteride, the active ingredient in Avodart®, which is used for the treatment of benign prostatic hyperplasia. SmithKline Beecham Corporation v. Barr Laboratories, Inc. Representation of Stryker in patent litigation relating to prosthetic hips. Representation of Barr in ANDA litigation relating to Travatan® and Travatan Z®, which are used for the treatment of intraocular pressure in patients with open-angle glaucoma. Alcon Research, Ltd. v. Barr Laboratories, Inc. Representation of Barr in an ANDA case involving patents relating to raloxifene, the active ingredient in Lilly's Evista product, which is used in the treatment of osteoporosis. Eli Lilly and Company, et al., v. Barr Laboratories, Inc. Representation of Barr Laboratories in ANDA litigation relating to Femcon Fe®, a chewable oral contraceptive product. Warner Chilcott Company, Inc. v. Barr Laboratories, Inc. Representation of Barr Laboratories in ANDA litigation relating to Focalin XR®, a drug product used in the treatment of attention deficit disorders. Celgene Corporation, et al. v. Barr Laboratories, Inc. Representation of Barr Laboratories in ANDA litigation relating to Entocort EC®, a drug product used in the treatment of inflammatory bowel disease. AstraZeneca LP, et al. v. Barr Laboratories, Inc. Representation of Barr in an ANDA case relating to Celgene’s Thalomid® drug product. Celgene Corporation v. Barr Laboratories, Inc. Representation of Sun and Caraco Pharmaceutical Laboratories, Ltd. in ANDA cases relating to Schering’s patent for Clarinex®, a pharmaceutical product used to treat allergy symptoms. Schering Corporation v. Sun Pharmaceutical Industries, Ltd., et al. Representation of Sun in cases relating to Cardene® I.V., an injectable drug product used for short-term treatment of hypertension. PDL Biopharma, Inc. v. Sun Pharmaceutical Industries, Ltd. Representation of Barr Laboratories in ANDA litigation relating to the oral contraceptive Mircette®. Bio-Technology General Corp. v. Duramed Pharmaceuticals, Inc. Representation of Barr Laboratories in ANDA litigation relating to fentanyl, a drug product used for pain relief. Cephalon, Inc., et al. v. Barr Laboratories, Inc. Representation of Abbott in a patent infringement case relating to Abbott’s patents covering a remote glucose monitoring device. Abbott Diabetes Care, Inc. v. DexCom, Inc. Representation of SecurityPoint Holdings, Inc. in patent infringement litigation relating to security checkpoint systems. SecurityPoint Holdings, Inc. v. U.S.A. Representation of a large national retailer in patent infringement litigation involving Wi-Fi technology. Representation of HTC in patent infringement litigation involving wireless transmission of caller ID information.